Recently, I’ve been watching David Letterman’s interviews on Netflix. He has an auditorium filled with people waiting to see him interview a surprise guest. His guests have been Obama, George Clooney, and soon Malala. The crowd cheers with each guest. Now imagine what would have happened if he announced more controversial figures – a shooter at one of the school shootings or Donald Trump. Or imagine he decided to interview an unknown person, let’s say Leonard Tows – a local person who cleans the streets. Imagine what it be like to be in the crowd for those guests. What you’re doing is feeling the energy of the crowd. You’re feeling or trying not to feel your emotions. You have a sense of what the audience is feeling and perhaps any splits of emotion in the crowd. You watch David Letterman and try to get a read of his energy and emotions about his guest. You watch the guest and get a sense of his energy and emotions in a liberal crowd. Your emotions and energy might be so strong that you can’t tune into anyone else. Many people have heard about energy healing, yet many people remain skeptical about it. What is it exactly? Anyone who’s practiced energy healing for a while or received multiple energy healings knows that there is incredible mystery and wonder in energy healing. Like any facet of life, you can explore it at a surface level or in depth. I can understand at a surface level that I have blood in my body. Then, there are people who study blood for their entire lives! Their comprehension is vast and has depth. Energy healing can be looked at in a similar way. 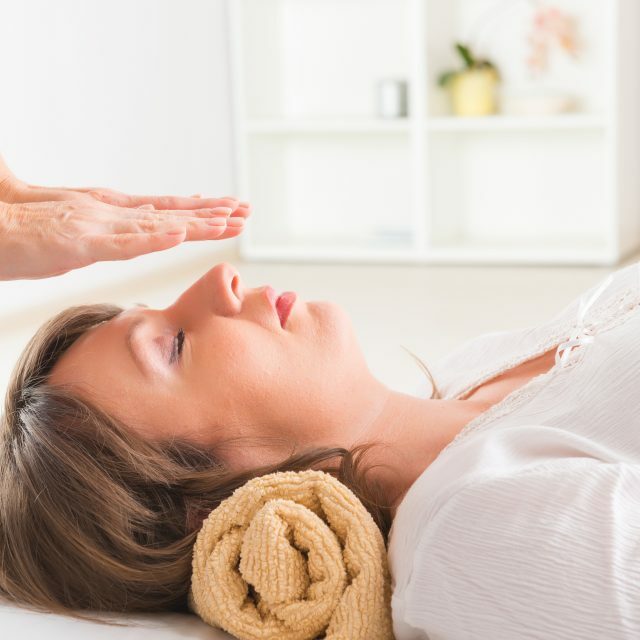 While energy healing has incredible depth, at its basic levels it’s fairly unmysterious. The easiest way to notice your own chakras or energy field is to notice it in relationship with other people. When we interact with people, our energy fields are ALWAYS interacting, and you’re probably more aware of energy than you realize. Your field of energy and your chakras are the invisible structures that are in motion in these situations. How you modulate your field or chakras will impact what emotions you feel or whether you feel any emotion at all. You might not feel anything – some people hug anyone with their hearts open and some people won’t hug anyone with their hearts open unless they feel safe with them. There is a dynamic in the energy between people. Can you remember a time you looked at two people and you could sense the depth of their connection? Here’s an example of the Canadian figure skating duo Tessa Virtue and Scott Moir in their gold-medal winning performance. They say that they are not romantically involved, but their connection is deep and sincere. You can also feel the audience’s connection with them during pivotal moments of their dance. On the other side of it, can you remember a time when you watched two people and could feel the tension even though nothing was being said? The show, the Office, was spectacular at awkward moments. Here’s a few clips of the relationship between Kelly & Ryan. The body language makes it pretty obvious what they are feeling, and yes body language is related to what’s going on in our chakras and energy field. While body language is helpful, there doesn’t have to be any obvious body language for us to tune into tension or love in the air. That feeling of connection is when our chakras are open. We close our chakras when we don’t want to connect with someone. Consider a time you were in an argument with someone you love. You might start to close your chakras because you are getting defensive. This will feel like distance between you and your partner. If someone is yelling at you, often you can feel the ickiness of someone trying to dump their negative energy on you. You may try to shield yourself from this person by blocking their energy from you. You might send daggers with your eyes. We all have a different energy signature (the way we modulate our chakras & field) when it comes to interacting with people. One of the easiest ways to notice this is in the difference in people’s personal space. You will probably be more comfortable to be closer to people that you love and trust. Everyone will have a different buffer with strangers. Seinfeld has a great clip of the cast interacting with a “close talker”. We all carry our chakras and energy field differently. Our signature is unique depending on our personality and circumstances that we grew up in. If you visit a different country, you will also notice general differences in personal space and depth of connection between people. Sometimes in life we build patterns of modulating our energy in situations that aren’t helpful to us. If you have social anxiety, you may notice both the part of you that really wants to connect with other people and another part that is terrified to do so. The conventional approach is psychotherapy or counselling for social anxiety. Traditionally counselling will use Cognitive Behavior Therapy (CBT) to help this person by connecting how her thoughts and her behaviors impact her emotions and vice versa. At a deeper level, her chakras and field are also connected to this mix. Shifting thoughts, behaviors, & emotions impact our chakras and energy field. So, an alternative approach can be to shift our energy field to shift our thoughts, behaviors, & emotions. Energy healing and counselling are a great combination. A practiced energy healer is person who is in tune with a person’s chakras and energy field. Their years of practice and experience have allowed them to tune into the energetic levels with skill and depth. Skilled therapists do this too without ever saying anything about chakras or energy fields. They tune into a person and get a sense of when their words and energy don’t match. They help balance a person’s energy field with their words and the feeling of safety in their presence. Counselling can help explore problems at a deeper level so that you can understand them more and make changes that are needed in a conscious way. Energy healing can be a wonderful gift in times where you don’t want to talk to anyone, but you want to feel relief. It’s also a great option for times when you’ve tried a lot of counselling and you’re not noticing any changes. It can be healing to take a break from thinking and talking about things. Personally, I found that counselling worked to a certain level, but that energy healing gave me the opportunity to heal. Energy healing is another method to help shift your energy field in places that you want change in your life. Want to learn more about counselling & energy healing? Contact me for free 15 minute consultation to learn more.